Уникальный по своей конструкции зонт DACAPO вращающийся во всех направлениях. Благодаря шаровому шарниру купол зонта, может быть, развернут в любую сторону и там зафиксирован. Подъем мачты зонта осуществляется легко и быстро с помощью стандартного газлифта, что позволяет в мгновение ока очень комфортно настроить и использовать ваш зонтик в нужном направлении в соответствии с солнцем или зашиты вашей конфиденциальности. Помимо базовой модели (DACAPO DG) консольный зонт DACAPO также имеет люксовую модификацию (DACAPO DK) которая имеет лебёдочною систему выдвижения по горизонтали и регулировку угла наклона. Модели DACAPO имеют различные формы купола. Можно выбрать круглые, овальные, прямоугольные или квадратные конструкции. Зонтик предназначен для частного сектора. Зонты DACAPO это элегантный дизайн - украшение для Вашего сада и террасы! 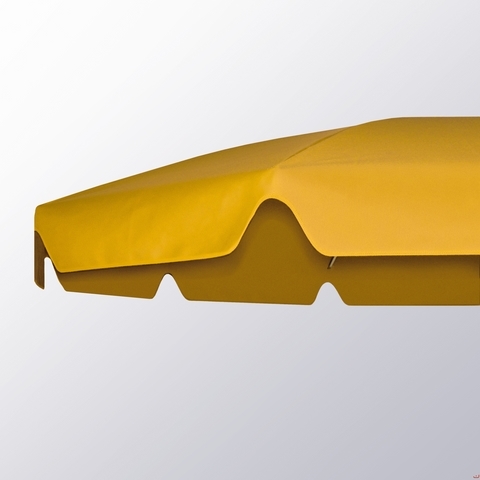 ne of the special advantages of the parasol DACAPO is its ease of use: With a few simple steps you can construct the shield, in its desired position - and either use as a conventional parasol or as an effective visual barrier. Just as quickly and easily, the parasol can be deconstructed. During inclement weather periods, a protective sheath can be easily placed over the screen. Standard height adjustment with gas spring for all free-arm DACAPO parasols. Technical details at a glance. 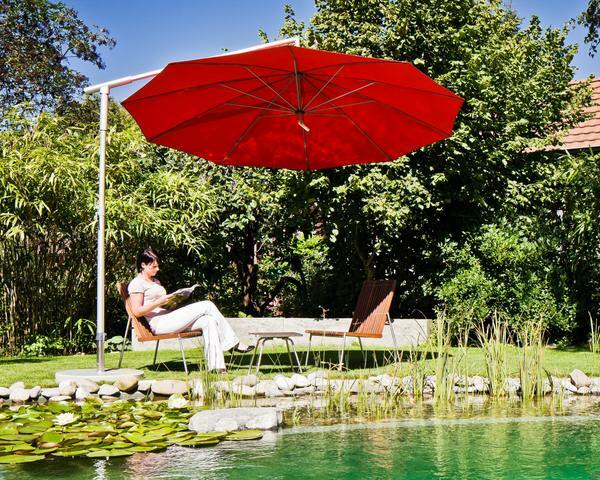 DACAPO-arm parasols offer unrestricted freedom of movement under its entire screen. The frame is made of very high quality, alloy, extruded aluminum profiles.The frame has an anodized surface, is high impact-and shock-resistant and available in the color EV1 natural silver gray. The spokes are made of spring steel and are available in powder coated in white RAL 9010 or RAL 9006 silver. The light traffic parasol DACAPO can be erected with very little effort and just as quickly folded up and stowed away - without the hassle of disassembly! Think about it; What other parasol can do this? The innovative ball joint allows the canopy of DACAPO to be adjusted according to the sun, even in 90 ° position to protect against slanting sunlight or as a screen from prying eyes. Shapes and sizes at a glance. The light traffic DACAPO parasol is available in different shapes and sizes - choose between round, oval, rectangular or square parasol! You can order or download an overview of all accessories available for your parasols for free from MAY. Our consultants are happy to help you in the selection of matching accessories for your parasols. Helping you find the right parasol. Customisable and open to your design requirements! 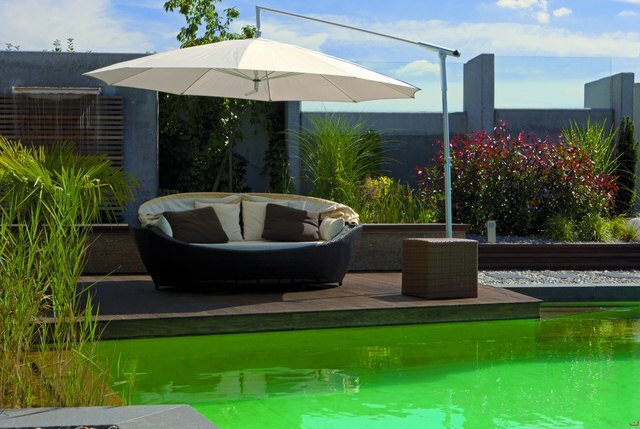 MAY parasols provide not only technical perfection, but also a design that meets your needs. For example, for the cover of your perfect parasol from two high-quality materials - Leacril TEXGARD Valmex-impregnation or Airtex. In both versions, you can choose from a variety of attractive colors. Provides the perfect visual complement you have the option to individually select the color of the binding tape. 30 attractive colors available. If you make your order and it does not show the color of the binding tape, the tape is chosen to match the chosen color of the shade fabric. The colours shown here are not a 100% accurate representation. If you require flawless colour comparison - please contact us and we can arrange colour samples to be sent. Easy to print - perfect for branding. Standing frames offer choice and flexibility. A classic in the mobile solutions umbrella stand is the stand frame. Its advantage: it combines high stability with great flexibility - this is your umbrella can be placed exactly where it fits best. To increase this flexibility, there is the standing frame for all MAY umbrellas in a mobile version (except for large screen ALBATROS). For placement on uneven surfaces of your screen are available as frame with angular adjustment screws. Match the standing frame is available from the corresponding RAL colours of course. Bottom weights. Incidentally, as the images show not only is this stand suitable as a mobile parasol stand, but can it also be integrated into a concrete patio floor. The shell height is freely selectable to match the height of your floor structure. An overview of all our parasol stands can be found in our brochure. Framestand with recesses for weights. Umbrella stand must actually be more visible? When you MAY find any free-arm and means for matching umbrella pole ground socket for concreting. This mounting option not only ensures reliable stability, but also supreme elegance with no visible weight elements. This is not only visually beautiful but also practical and convenient: your patio floor is almost entirely usable as space, without any difference in height and weight elements. As an alternative to cast-in ground sockets to provide ground sleeves with anchor plates, which can be aufgedübelt on the ground. These anchor plates variant is also suitable for installation in higher floor structures. All soil cores are also foldable for easy installing hinge sleeve available. Just ask our consultants for a suitable ground sleeve for your sun screen! An overview of all our parasol stands can be found in our brochure. Standard parasol ground sleeve - Ground sleeve with hinge. Wall mounts for cantilevered parasols. Have you consciously decided to offset umbrella, to as much freedom of movement under the canopy have? Then you can increase it even more freedom of movement - with a wall mount, which eliminates the conventional umbrella stand on the terrace floor. The wall mount is made of a sleeve, which is associated with a stable, sturdy base. To mount the base plate is bolted to simply plugs into the wall. A simple and stylish alternative! 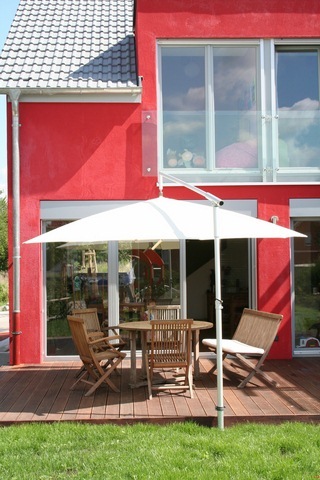 Just ask our consultants for a suitable wall mount for your parasol! An overview of all the parasols stands we have, download our brochure. A matching stand for your MAY parasol. Traditional or cantilievered parasols, round or rectangular, smaller compact parasols for the private garden or large screen parasols for commercial purposes: MAY offers the best sun shield for each request.This naturally also includes the appropriate umbrella stand for your dream parasol - and here MAY depends entirely on your wishes and ideas. Our program offers parasols stand as an elegant granite stand, extra-light frame as crosses and solid. For the stationary mounting there in MAY to match any shade anchor plates to bolt to the ground and anchor sleeves in concrete.For all parasol models we have wall mounts available to a professional safe, high standard. We have many parasol stands available - ranging from concrete panels suitable for stand and crosses stand frames to effective theft protection for your parasol. An overview of all our parasol stands can be found in our brochure! Or ask our consultants - they will help you in selecting the optimum parasol stand! Current trend: Granite parasol stands for the models MEZZO, DACAPO and FILIUS. Aesthetically pleasing solutions: Parasols using ground sleeves. A moveable stand - anywhere you want it. The clever idea for those who like it very flexible: With the moveable parasol stand from MAY you can place your parasol on the fly exactly where you want it - and conveniently, without the hassle of bending over and with virtually no effort! 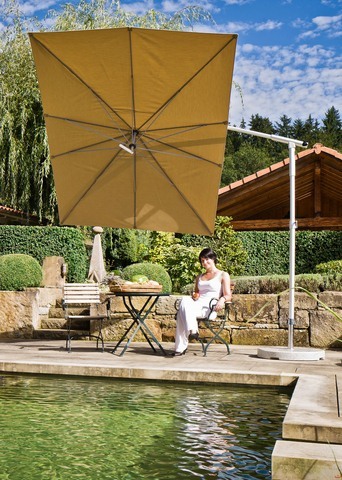 The innovative technology makes moving the shade easy: Simply remove the lateral telescopic rod which easily folds down - thereby locking the wheels in the stand base. Now, the parasol can easily be pulled in all directions and repositioned. If the new location is found, simply lock the wheels to provide the telescopic pole upright and then pushed together. The whole thing works, of course, even with the shield. The robust design of the drive stand is extremely stable, strong and durable. Available for free-arm sunshades and MEZZO DACAPO and for the large screen FILIUS. Just ask our consultants for the practical driving stand for your large parasol FILIUS! An overview of all of our parasol stands can be found in our brochure. 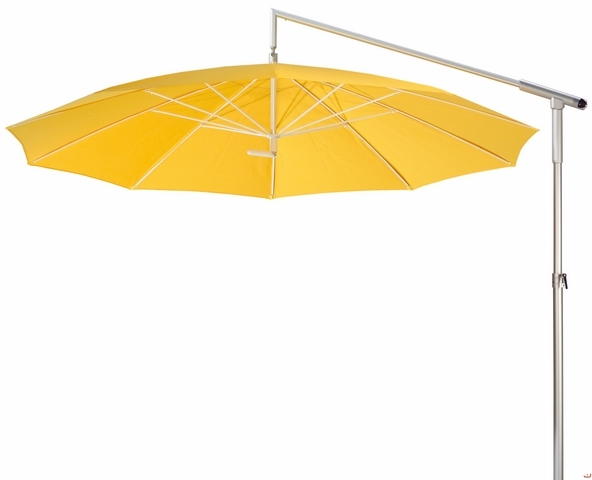 For each of our parasols you can find the appropriate securing devices such as parasol stands, cross stands, anchor sleeves, floor tiles and wall mounts. Our stands provide safe and secure installation or mounting of your parasol. Securing your parasol with a parasol stand is vital for safety. Check out the many methods of securing your parasol with a variety of parasol stands starting at our parasol stands page. 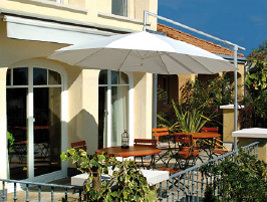 For the large commercial umbrellas FILIUS, SCHATTELLO and the practical ALBATROS sidewalls are available. They offer protection from side winds or transform your centre masted-screen in an instant into a tent. With special rain gutters you can connect several large parasols to form a continuous rain roof. The Cantilevered Parasols and SCHATTELLO and ALBATROS can be equipped with optional heaters and lighting. Even for the most basic model of the parasol ALBATROS, an electric heater is available. Do you have other accessories requirements? Our trade consultants can help you! Contact us or request more information here.